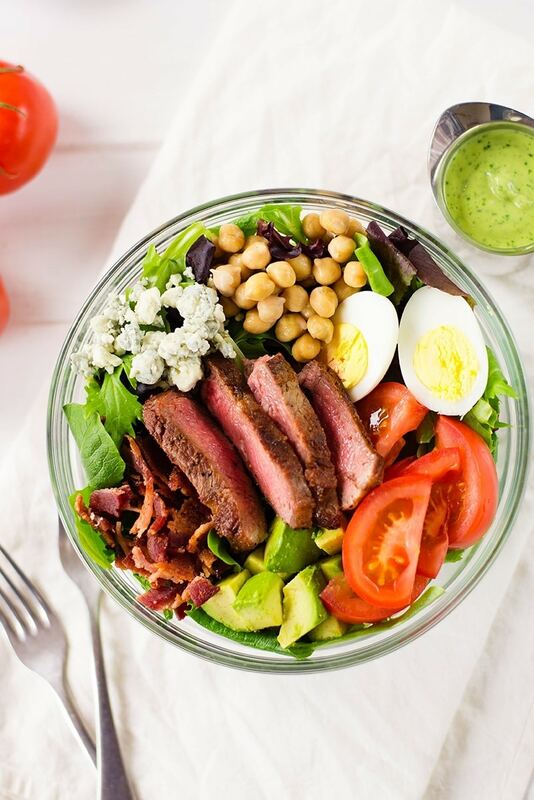 Enjoy this delicious, easy, and healthy Steak Cobb Salad with homemade avocado cilantro lime salad dressing. 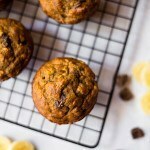 So fresh and so easy! 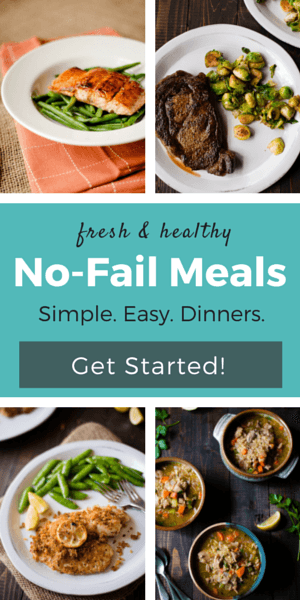 Are you trying to eat healthy and possibly even follow a mostly clean lifestyle? 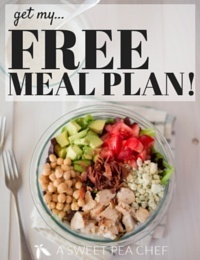 Tired of eating salads that aren’t filling? Want some tasty, healthy salad goodness? 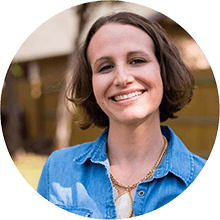 If you said, “Yes!” to any or all of the above questions, I have the solution for you. 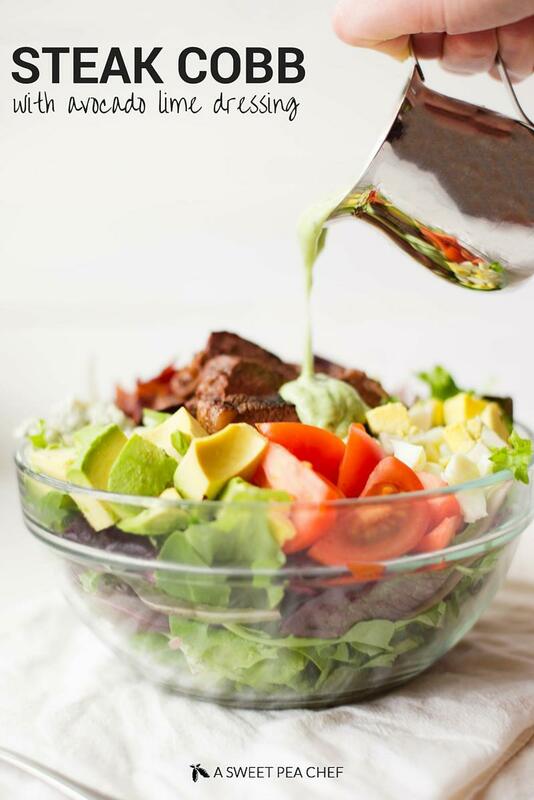 Try this healthy steak Cobb salad with (the most deliciously scrumptious ever) creamy avocado cilantro lime salad dressing. Ready for a history lesson on Cobb salad? Awesome. The Cobb salad was first created in the 1920s at the Brown Derby Restaurant in Hollywood. Since then, the Cobb salad has become a classic American staple, loved for its great texture and glorious flavors: crisp greens, tender chicken breast, eggs, bacon strips, avocado, tomato, and blue cheese. Heaven on a plate! One. 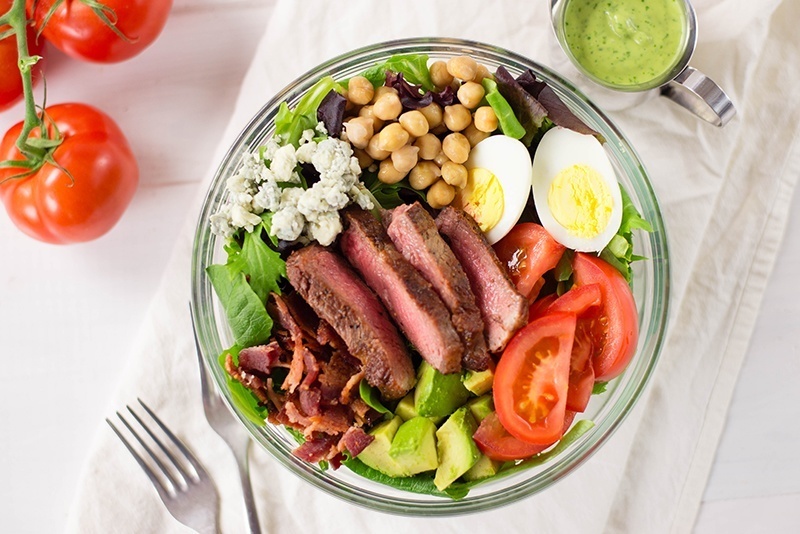 This steak Cobb salad is vibrant and fresh. Two. This steak Cobb salad is actually filling – which is a major complaint I have with eating a salad for a meal. I need meat (read: lean protein) and lots of goodies in my salad. I want variance and textures and flavors, people. Three. This steak Cobb salad is pretty friggin’ delicious. So even if you don’t much care for “healthy” food, you’ll still love every single minute of this meal. Four Through Seven. 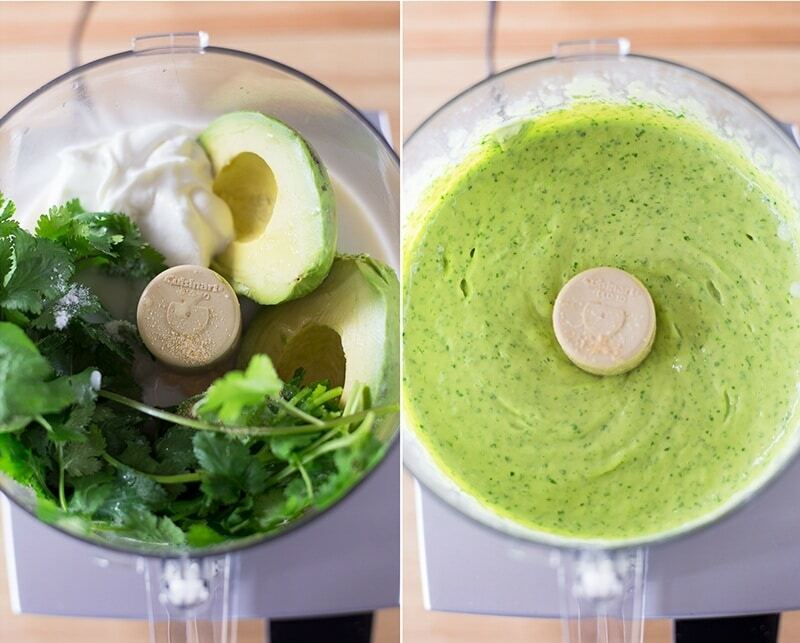 Avocado Cilantro Lime Dressing. In other words: Yaaaas. Is a Cobb Salad Healthy? 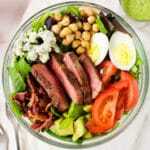 This steak Cobb salad makes a great lunch or healthy weeknight dinner. For realz. This recipe is a fresh take on the original, containing all the good stuff like protein, eggs, bacon, and avocado. But I cut the saturated fat in half by reducing the amount of cheese and bacon typically used in a Cobb salad, while doubling the amount of healthy fat by choosing avocado and plain Greek yogurt in the avocado cilantro lime dressing. This yummy dressing gives the Cobb salad that signature tanginess and creaminess, while still being nutritious. I also like using New York strip steak because it’s leaner than ribeye, but still flavorful, though any steak will do. Heck even chicken would work. 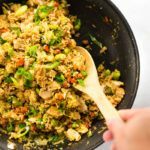 The major idea here is to include a lean protein to fill you up, nourish your body, and make your tastebuds (and waistline!) healthy. Hard not to love that! Delicious, easy, and healthy steak cobb salad with homemade avocado cilantro lime salad dressing. 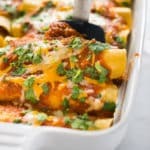 So fresh and so easy! 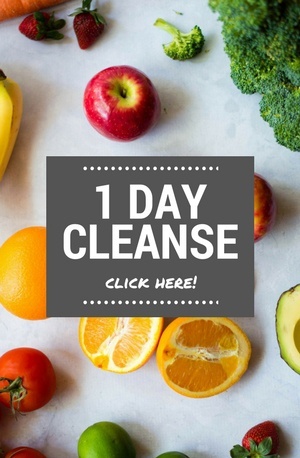 To make the salad dressing, combine the avocado, plain greek yogurt, fresh cilantro leaves, garlic powder, sea salt, lime juice, and almond milk either in a food processor or a blender. Blend together until smooth. If the consistency is not pourable, add a touch more almond milk. Okay set the dressing aside while we prepare the rest of the salad. In a skillet, cook 2-3 slices of bacon over medium-high heat until crispy. Once it’s nice and crispy, remove from pan cooled. Then, break it into crumbles and set aside. To hard-boil the eggs, place 1-2 eggs in a pot and cover with cold water by about 1 inch. Bring to a rolling boil, then cover, remove from the heat and set aside 8 to 10 minutes. Drain, cool in ice water and peel. Season the steak with the kosher salt and pepper and cook in the olive oil over medium-high heat until well-browned on both sides, about 6-8 minutes per side, or the internal temperature reaches 145 degrees Fahrenheit. 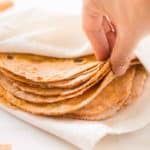 Once cooked, remove from heat, allow to rest a few minutes, and then slice. 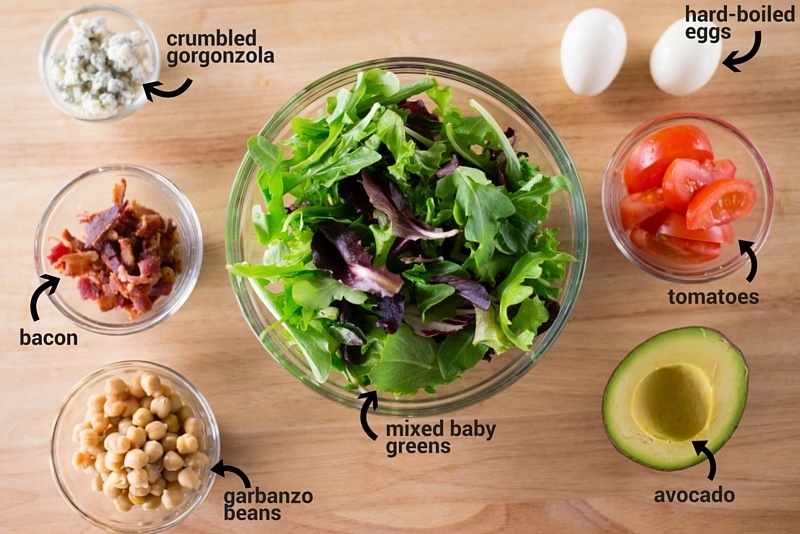 To assemble the salad, start by filling your salad bowl with mixed baby greens and then adding the bacon crumbles, some diced avocado, fresh tomato, the hardboiled egg, garbanzo beans, the steak and gorgonzola crumbles in separate, small piles on top. Just made this and loved it! Great for this heat and humidity we are having here in New England! Salad dressing is to die for! Yea, it’s so delicious and packed full of goodies! Uh, YUM! This is my kind of salad- hearty, flavorful and totally delicious. Love that dressing,too! I’m not a huge beef eater either, but I do crave a good steak every now and then – I could definitely dive into this recipe! Pinned . Lovely photos! Woot! 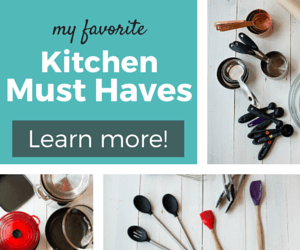 Thanks for pinning – I hope you love it! Hmmm…I would go with the written recipe since it can get updated over time whereas the video can never be updated which is super annoying.